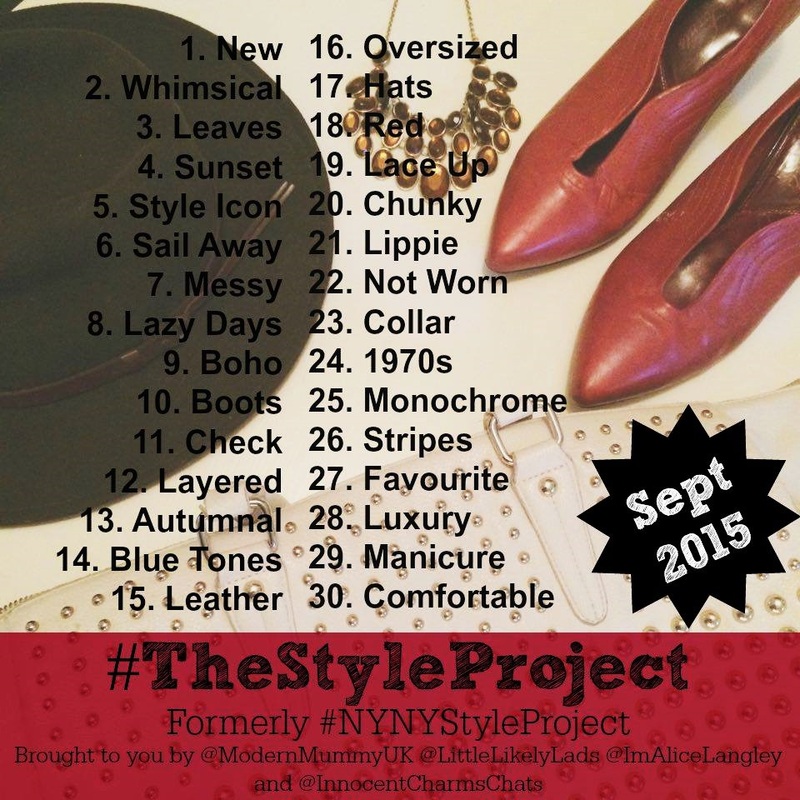 #TheStyleProject is back! (Formally known as the #NYNYStyleProject) For veteran readers you will already know that the #TheStyleProject was set up with style bloggers and friends Katy, Kara and Alice as a bit of fun, a way to inspire women like ourselves who felt like our style needed a bit of oomph from time to time! For some it was the encouragement to wear that top you've had for ages but never wore. Or to just wear heels instead of flats for a change. Or even something as simple as wearing lipstick. For me I just felt the prompts made me style what I already had in my wardrobe a little differently to how I would normally, giving me fresh new looks. So I'm pleased as punch it's back! If you are unfamiliar on how it works here's the deal - A daily list of prompts will be released each month on Instagram and Twitter using the hashtag #TheStyleProject, these prompts can be interpreted however you please there's no rules just include the prompt when getting dressed that day. For example Day 1 prompt is 'New' and I am looking forward to taking a photo of my new patent boots I bought this weekend., I will share it on both of my Instagram and Twitter account and hashtag #TheStyleProject that's it! It's really that simple but can make a huge impact on how you feel about the way you look. 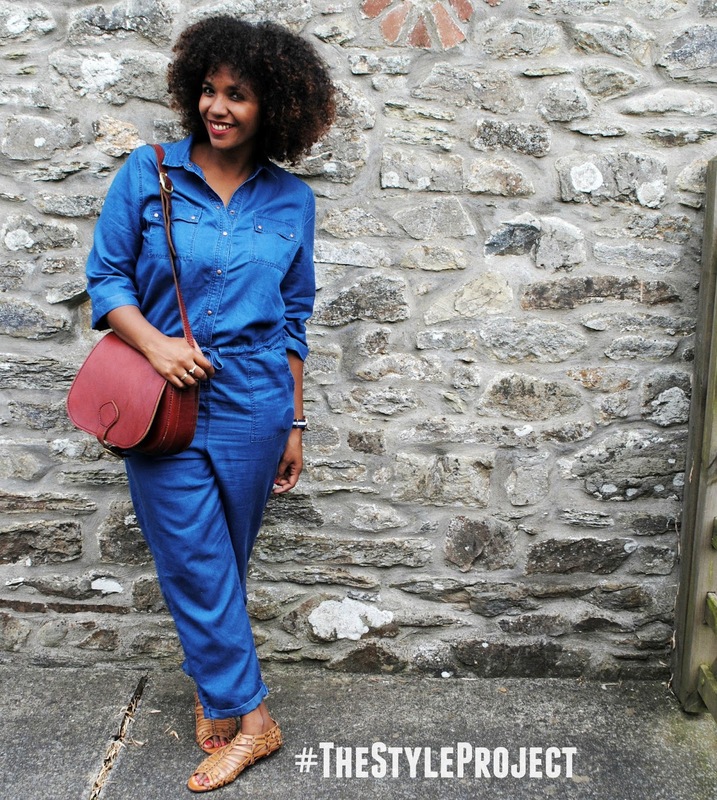 At the end of each month I would like to give a little shout out to my favorite #TheStyleProject photos here on this dear blog (with your permission of course) you know, share a bit of the love. Looking forward to seeing your style! We took the little lads blackberry picking the other day. They love blackberries so were extra enthusiastic when picking so we ended up with loads! Having snacked on them and made a yummy apple and blackberry crumble, I still had a few left over but not quite enough for blackberry jam so thought I would make blackberry muffins with the rest. Some of the smaller blackberries can be quite sharp so thought it would he nice to team them up with white chocolate. I don't want to toot my own horn but my blackberry and white chocolate muffins were amazing!! I ate two, one straight after the other, while they were still warm! The little lads loved them too! Cream together the Butter and Caster Sugar until smooth. Slowly add the beaten eggs, mixing as you pour. Add a few drops of vanilla essence (this is optional but it makes it smell amazing!) Then gradually add the sived Flour and a Baking Power. Leave to chill for at least an hour. Once chilled set pre-heat the oven to 190 degrees and line a muffin tin with 6 muffin cases. Pour the mixture into the cases and stud with 4-5 blackberries and 4 chunks of the white chocolate (I snapped a cube of white chocolate in half otherwise it was too big) Then Cook for 15-20 mins or until muffins have risen and are golden brown. Once the blackberry and white chocolate muffins are cooked, leave to cool in the tin for a few minutes before placing them on a wire rack. And enjoy! 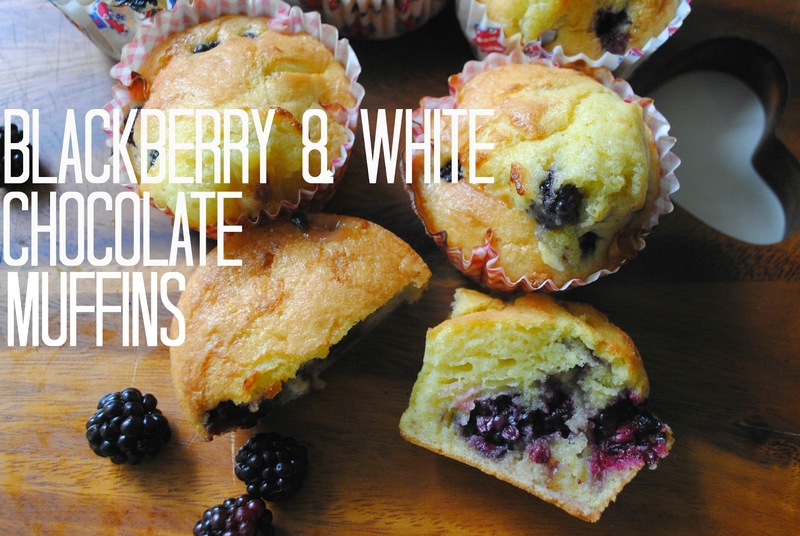 If you give this blackberry and white chocolate recipe a go, let me know if you liked it as much as I did? This weekend was one of those weekends you just never want to end, the sun was shining, the little lads were on their best behavior and so incredibly cute and The Mister was on good form, giving me hearty belly laughs all weekend long. Maybe it's because we have officially started our summer holidays with The Mister having two whole weeks off work so we are all really able to relax into it- life feels good. On Saturday we had my friends wedding to go to that afternoon so didn't want to venue to far away from home. Tiger has recently started to ride his bike and loves going out for family bike rides and luckily we live close to a lovely river to cycle along. So we packed a few snacks in my basket, a blanket and set off. 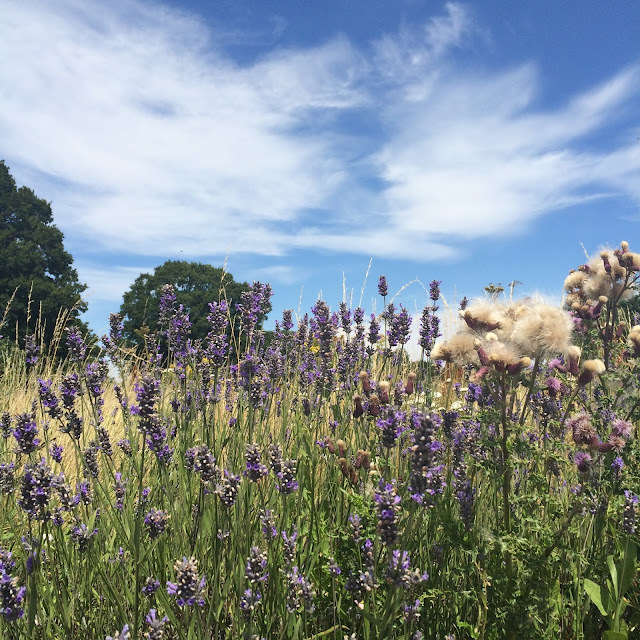 I'm terrible and always stopping to take photos along the way and came across a lovely full lavender bush near the bank of the river which begged to be photographed. 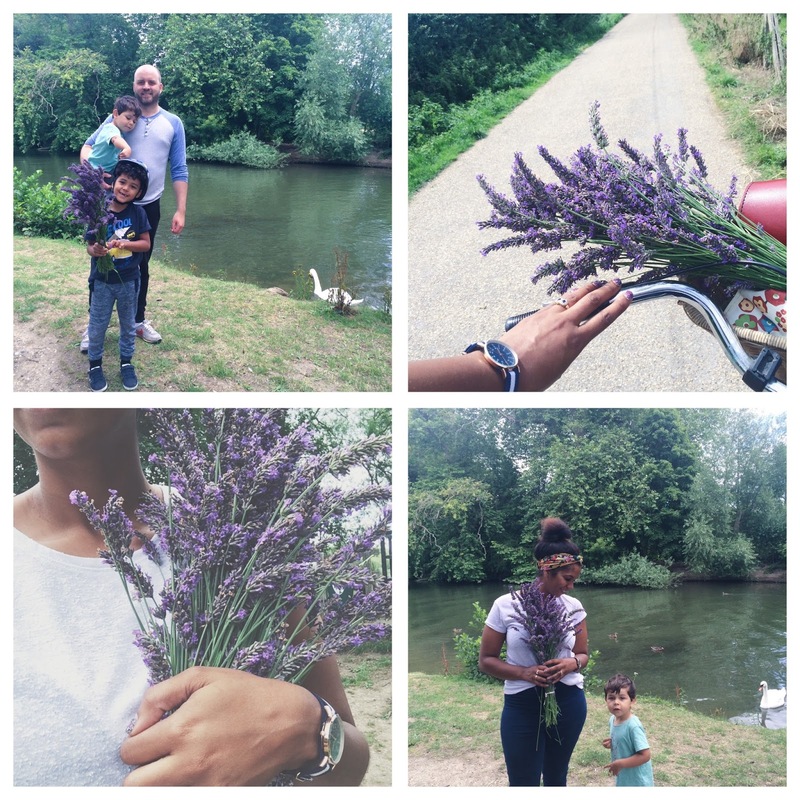 As I was snapping away the owner of the lavender came over for a chat, he also loved taking photos of the lavender with the river as an amazing back drop. He then nipped off and came back with a huge bunch of lavender for me! It was such a sweet thing to do and really made my day. I felt quite the county girl riding along with my beautiful bunch of lavender in my little wicker basket. 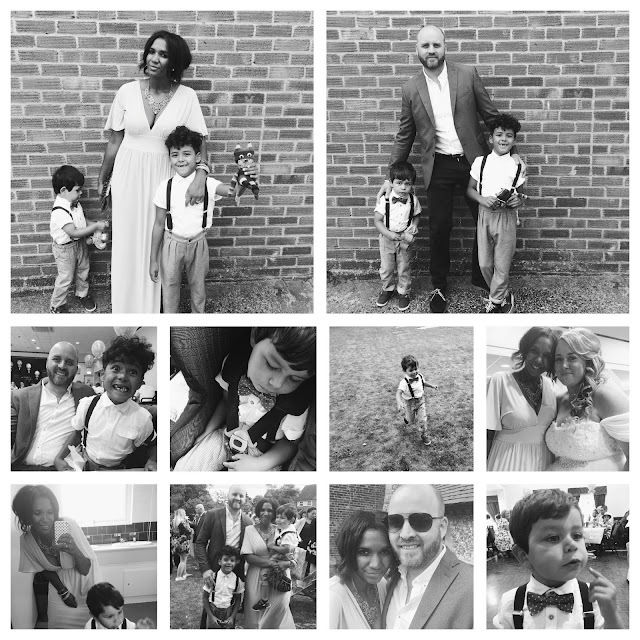 After our bike ride we rushed home to get ready for the wedding, the little lads and the mister wore semi matching outfits and looked gorgeous. I might have cried a little bit seeing the little lads in their braces and bow ties. They were both chuffed to bits to be 'dressing like daddy going to work' although I've never seen the mister wear braces or a bow tie , but I think they just meant smart. The wedding was lovely and my friend looked gorgeous, happy emotions pouring from her as she walked down the aisle, just beautiful. At the reception Beaux couldn't wait for the music to begin, I think he may just be a little raver when he's older! For the entire time he spent it dancing in the disco lights! I have no idea where he gets his moves from but he could definitely teach me a few moves! Cutest thing ever!!! Sunday we collected Violet, we've all missed her especially Tiger, he is so excited that he's got two whole weeks with his sister. We set off to a car boot sale as we all love a good rummage looking for little treasures and we found some beauties! My favorite an Art Deco mirror for only £2!! I hung it as soon as I stepped through the door, it fits in perfectly with my mirrored statement wall. Lastly we went to see a potential wedding venue! Eek it's perfect, breathtaking views and surrounded by fields of lavender and thistles! We are so excited to get planning.